Rovex Devil Mono, one of the best low priced monofilaments, suitable to use in many fishing situations, available in 1/4lb bulk spools. Great value. Rovex XTS Mono features extremely fine diameters to breaking strains. 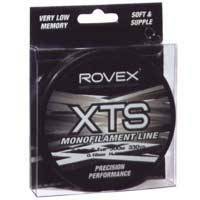 If your fishing application demands excellent casting performance, low stretch and a soft supple feel then Rovex XTS Mono is the line for you. XTS Mono will literally flow from your reel when casting providing accuracy along with casts far greater than you would expect from other lines. Rovex XTS is made using a super copolymer nylon formula.